An elegant 5-bedroom Georgian style farmhouse, Emmetts Grange overlooks a beautiful 900 acre moorland estate offers some of the most stunning views out onto the rugged beauty of the Exmoor landscape across which herds of deer can frequently be seen to roam. Emmett�s Grange is the highest farm on Exmoor hence the clean fresh air and brilliant starlit night skies. Emmetts Grange, the main house sleeping 11, alongside a smaller Linhay, a ground floor studio apartment sleeping 2. 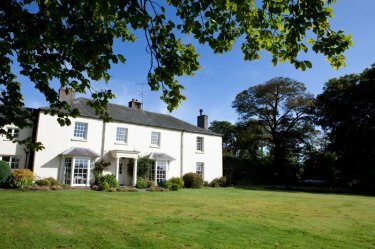 Both provide superb luxury accommodation surrounded by formal gardens framed by mature beech trees and looking out onto fields and moorland. Emmett�s Grange boasts five bedrooms, each named after colourful characters associated with the history of the house. All tastefully furnished, three are en suite, and include colour televisions. For anyone seeking to spend their holiday walking, riding, cycling or simply relaxing amidst beautiful scenery, the Grange is the perfect country house for a leisurely holiday spend a holiday in a unique and spectacular paradise. On entering the traditional hallway your eyes are immediately drawn to light from the morning room. Decorated in powder blue the gentile room features a Steinway piano and other instruments to play, Relax on the padded window seating which provides some of the best views out onto miles of Exmoor countryside (binoculars are provided for deer spotting). 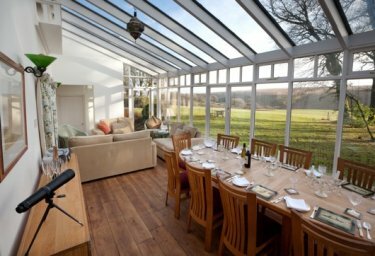 The Victorian conservatory with its widescreen TV and Wii games console it�s a favourite place for the children to relax, and with a large pine dining table seating 12, it�s ideal for lunch and evening meals. With views onto the woodland and gardens it can also be the ideal spot to relax on the sofa and bask in the warmth of the sun all year round. The kitchen, with views out onto the courtyard the traditional farmyard kitchen features a double fridge/freezer, dishwasher, gas oven, and plenty of work space to make a tasty meal. For drinks there is the Butler�s pantry, a charming bar area. With a wine cooler and seating overlooking the courtyard. The exquisite candlelit dining room with seating for 12 offers an open fire and antique furniture. Catering can also be provided on request with menus of sumptuous locally sourced, seasonal meals. 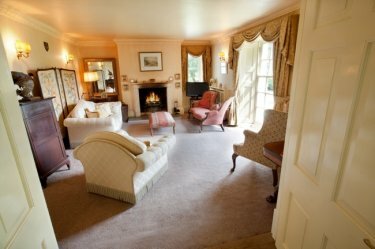 To relax after your meal there is a comfortable period drawing room full of plush sofas and comfy chairs to relax in and simply watch the TV or alternatively watch the captivating moorland bobbing in and out of the cloud whilst warming yourself in front of the log fire. Through the double doors of the drawing room lies the library; ideal for getting lost in a book or writing an old fashioned letter. For rainy afternoons there is a snooker table and antique Bagatelle table, as well as a excellent selection of traditional board games and a huge selection of good books. For those wanting to catch up on day to day tasks there is also a comfortable furnished office with both wireless internet and fax machine as well as a utility room with a washing machine and tumble dryer. 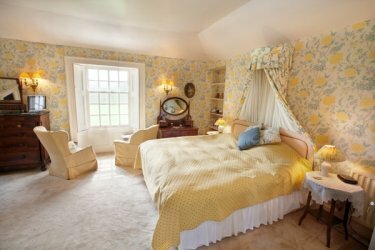 The Knight Room: A warm yellow room boasts a super king size bed with pelmet and an additional single bed. The bed can also easily be spilt into two to allow a room of three single beds. The room also comes with a large blue en-suite bathroom with bath, shower and WC. The Fortescue Room has a four-poster bed, comfy arm chairs and window seat providing spectacular views out onto the moor. It also has an en-suite bathroom with power shower, bath and WC. The Josh Brown room, a cosy twin or double room comes with its own sofa and views out onto the moor and the Derby Haddon room, a twin room overlooking the courtyard with its own private bathroom and WC. Finally, the Bunk Room with views out onto the courtyard has a set of bunk beds making it ideal for children. The bunk beds are full size and can be separated to form a twin room if required. Both the bunk room and the Josh Brown room share a large bathroom with bath and WC decorated in a stylish blue beachside theme. Outside the front of the house sits a large croquet lawn with wooden tables and chairs leading down to a ha-ha separating it from the moor. With unforgettable views out to the surrounding moorland estate, it�s the perfect way to spend an afternoon. A traditional vegetable garden and fully sized tennis court also sit to the side of the house and all feature exquisite uninterrupted views out onto the surrounding countryside. To the back of the house lies the courtyard where chickens and guinea fowl range free. One of the old barns features a large table tennis table, snooker table and skittle alley making it an ideal escape for the children. Further afield guests have sole use of the Estates some 900 acres and are free to walk and ride across the miles of unspoilt moorland. Prices shown start from the lowest weekly rate offered for the time period quoted.